Anyone familiar with API VCA based compressors will quickly be at home with the API 527. This compressor offers an outstanding degree of adaptability in signal gain control because of qualities recurrent to the line: "feed forward" (new) and "feed back" (old) gain reduction methods, both of which are selectable on the front panel. Most established compressors use the "old way" or Feed-Back method for the gain control circuit, whereas it's more typical of newer VCA type compressors, that rely on RMS detectors for gain control voltage, to use the "new" method of gain reduction. Innate uncompressed sounds or a typical cutting knee type that lends itself to a much more extreme limiting effect can be generated by utilising a Soft/Hard switch. The initial operating parameter is set by the Threshold control and the API 527 can be managed with signal input levels from +10dBu to -20dBu. 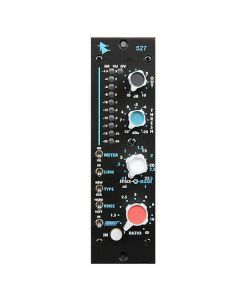 A sizeable API output transformer and 2520 discrete amplifier offer output capacity of +28dBu and the API 527's output fader control spans from minus infinity to +10db. Regardless of the threshold or ratio control, the output level remains at a relative equilibrium - much like the More/Less ceiling control on the API 525 compressor, making live adjustments possible without any noticeable gain changes in the program level. A high pass filter is implemented before the RMS detector circuit, preserving a punchy bottom end, by the patented THRUST function that can be alternated in and out via the front panel as well. The API 527's Attack and Release are completely changeable. Swivel the inner concentric Release knob to change release time with constants from .3 sec to 3 sec. The outer concentric Attack knob adjusts Attack time which ranges from 1 millisecond to 25 milliseconds. Two API 527 devices can be integrated for stereo applications via a motherboard bus connection through the use of the Link switch, but the API 527 is also built with the intended purpose of individual channel use. The API 527 Compressor demonstrates the dependability, longevity and uniformity characteristic of all API products and makes use of 2510 and 2520 op-amps.